Glass grinders are often the main machine used in stained glass. They are important machines to many of us and so need proper maintenance and use to give us long service. This note is about the things you need to keep in mind about maintaining the grinder. Glass grinders are very handy tools. They mainly consists of a spinning diamond coated cylinder (the bit) extending above a grid surface that can rapidly and accurately grind glass to the desired shape. Don't purposely cut glass large with the intention of grinding. Ideally no grinding would have to be done. It should be used only for minor adjustments or for grinding tough-to-cut inside curves. The water reservoir should be emptied each day after use. It is not advisable to have standing water in your grinder for some health reasons, avoiding unpleasant smells, and as moving a grinder with water risks damaging the grinder’s motor and other equipment and materials in the studio. Even if you do not move your grinder about, the water needs changing just as frequently as the glass grit needs removing. Some people line their reservoir with aluminium foil to catch the grinding residue. 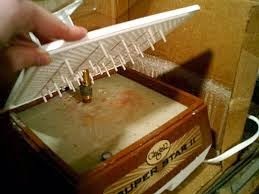 This may not be possible on all grinders, but does reduce the effort of cleaning the grit from the bottom of the reservoir. Ensure you clean your sponge (if the grinder uses one) when cleaning out the reservoir. If you do not clean it regularly, it will become hard and stop bringing water to your grinding head. The accumulated glass grit should be cleaned out with scraper or paper towel and disposed of in the waste, not down a sink. The glass grit is relatively heavy and will become solid and block your drains. If you have a garden, the glass grit is a good soil modifier, by helping the drainage. 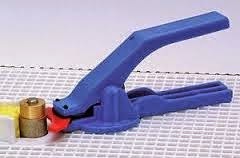 The glass grit will accumulate and restrict the flow of water to your grinding head. Clean any plastic eye shield with running water, as rubbing it will scratch the surface. Ensure there is water in the reservoir before starting any grinding, but do not over fill as the excess water could get into the motor. Empty the reservoir daily. This keeps the water from producing a smell, and allows you to clear the glass residue from around the grinding bit. Too much pressure will cause the glass to chip. It may be that you are pressing the glass into the grinder head too hard. The grinder head should do the work. Firm rather than hard pressure should be applied. If the grinder motor slows, it is an indication that far too much pressure is being applied. It will also lead to cuts on your fingers. Run the glass lightly against the grinder all the way around to remove any overlooked sharp shells on the glass. Then light pressure will not cut your fingers while grinding. Grit size has an influence on the way the edge appears. It is possible that you may be using too coarse a grit on the grinder bit/head. The coarser the grit is, the larger the chips will be taken off the edge surfaces. Smaller grits take smaller chips off the edges, and so are less obvious. New bits can be a source of chipping. Oddly, new bits can cause chipping. If it is a new bit that is causing the chipping, consider dressing it. New bits often need to be dressed – removing protruding diamonds, or cleaning and exposing new ones on a worn bit. 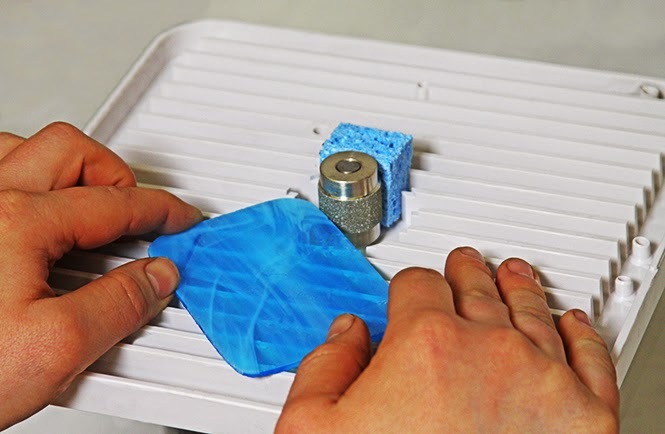 To dress the bit you can grind some scrap glass, brick, or use a dressing stone to lightly grind some of the abrasive material away. This most often settles the bit and avoids chipping. 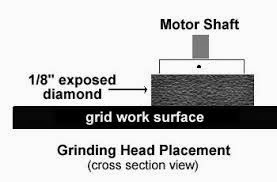 A worn or damaged grinder bit/head can cause chipping. Inspect your bit carefully for smooth areas showing that the diamonds have been worn away. Also look for dents, and other irregularities on the surface, indicating that the bit is damaged. Any dents or smooth places on the bit cause a vibration that is similar to a tiny hammer tapping the edge of the glass. This shows that chipping of the glass is most often comes from the way the machine is used rather than the grinder head needing replacement. Insufficient water supply can reduce the life of the grinder head. 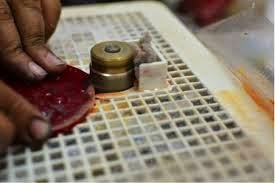 If there is too little water reaching the head to lubricate the diamonds and keep the glass cool it can reduce the life of the grinder head, by overheating it too. If you are getting a white paste or a powder on or near the glass, you need to increase the water supply. This may indicate a low water level, too much grit in the reservoir or sponge clogged preventing sufficient water reaching the grinding head. Vaseline for the shaft and grub screw. Smooth any corrosion from the shaft with fine wet and dry sandpaper and lubricate the shaft. Periodic removal of the bit and lubrication of the shaft should be part of the regular maintenance of the grinder. 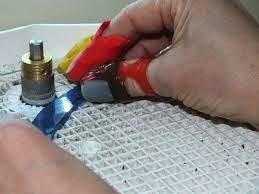 Also ensure the grub screw is kept clear of glass grit by putting some Vaseline in the recess. This keeps the threads and the slot for the alan key from clogging up with glass grit. The first step in removing the grinding head is to loosen the grub screw that fixes the head to the shaft. This is often full of glass grit, so clean the recess for the alan key first. I do this by using a needle or other thin sharp object to clear out all the glass powder from the recess in the screw and the threads. I am sure there are other things that can be used to clean out the hole too. When clean, insert the alan key as far as possible and while holding it in turn the key in an anticlockwise direction. If it will not move, you need more leverage. 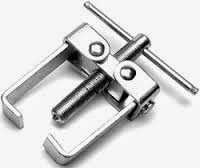 If the alan key simply spins in the recess, you need a stud bolt remover tool. This is a tool that many mechanics and tool shops have. It is normally square or triangular. 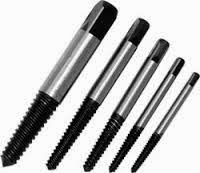 It is used by drilling into the broken off bolt. The tool is tapped into the hole and then with a wrench/spanner the grub screw is loosened. In the case of the grub screw the recess is already there so you only need to hammer the removal tool into the alan key recess and proceed as normal. 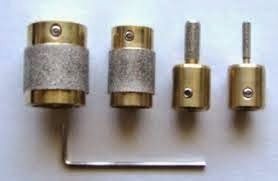 The more modern and safer method is to use a tool with a reverse thread on it. This means that as you turn anti-clockwise, the tool thread bites into the recess and brings the grub screw out. If the grinding bit is already seized, the method of removal is based on how fast it is stuck. If there is a bit of movement around the shaft when the grub screw is removed, you can probably remove it with simple tools. First use very fine wet and dry sandpaper to remove all corrosion and roughness from the upper, exposed part of the shaft. Put a thin film of lubrication or penetrating oil on the shaft and then you can hold the top of the shaft tight with smooth-jawed pliers while you twist the bit. Be careful not to mark the shaft or you will create another obstacle to removal of the bit. Alternatively, while pulling up on the bit, you can tap the top end of the shaft gently with a plastic hammer to shake the bit loose. If this does not work, remove the grid and turn the dried grinder upside down and spray WD-40 or other penetrating oil to the bottom of the grinder bit. This should be left for a few days with renewal of the penetrating oil every half day. Then try the methods above to free the bit from the shaft. If the bit is still firmly stuck, you will need a small wheel puller to get the bit off the shaft. Small wheel pullers are available from most DIY or mechanics suppliers. Once you have the bit off, smooth any corrosion from the shaft with fine wet and dry sandpaper and lubricate the shaft. Periodic removal of the bit and lubrication of the shaft should be part of the regular maintenance of the grinder. 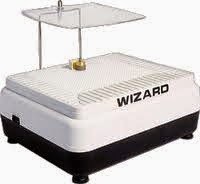 If your grinder bit is too low or too high the diamond surface will not grind the whole of the glass edge. This can lead to chipping of the surface of the glass at the edges. A good practice is to start with the bit as high as possible to allow for differing thicknesses of glass. As high as possible is with the bottom of the diamonds just below the platform of the grinder. This will ensure that you can deal with varying thicknesses of glass without immediate adjustment. You can then lower the bit as it wears. Here the head is only just low enough to catch all the glass. It should be a little lower. Be certain that you secure the grinding head with the grub screw facing the flat part of the shaft. Failure to do that will both mark the shaft, making removal difficult, and potentially allow the shaft to spin while the head remains stationary. Of course, you need to ensure there is adequate water reaching the grinding bit to avoid overheating the glass, and to keep the dust from grinding from getting into the air. Water is the primary lubricant. It washes the grit from between the diamonds and keeps the head cool. It also cools the glass, of course. You can buy an additive for the water – often called a diamond coolant – which is intended to provide a kind of lubrication for the diamonds. This may also extend the life of the bit. 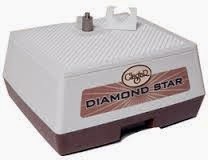 The diamond bit must be kept wet in order to reduce wear on the diamond and prevent glass dust from developing and being inhaled. There are several grits available. "Fine" grinds slower but leaves fewer chips out of the glass. "Coarse" grinds very fast but leaves larger chips. "Standard" is a central compromise. Smooth any corrosion from the shaft with fine wet and dry sandpaper and lubricate the shaft. Periodic removal of the bit and lubrication of the shaft should be part of the regular maintenance of the grinder. The maintenance is not only on the shaft but also on the fixings. Putting a dab of Vaseline or thick grease into the grub screw socket will help keep it clear of the glass residue. It may be that you are pressing the glass into the grinder head too hard. The grinder head should do the work. Firm rather than hard pressure should be applied. If the grinder slows, it is an indication that too much pressure is being applied. Extending the life of your grinder bits is a matter of recognising that you should not force the glass into the grinding head. Excessive pressure against the head heats the bit and allows the diamonds to become free of the binding material, so reducing its life. If the motor slows as you press the glass to the bit, you are applying too much pressure. That kind of pressure also puts a lot of wear on the bearings of the motor. If the grinder is not taking glass off fast enough for your purposes, you should put a coarser bit on the grinder, rather than press harder. The bits do come in a variety of grits. Try out some different grits to find the one that works best for the speed at which you want to remove the glass. Have you found that different bits are better or worse than others? Whenever I have a big grinding project in front of me, I wonder if I could be doing it faster with a better bit. Mine are glastar and gryphon, and look just like your pictures. Thanks so much! Where do you drain the water when you are emptying the grinder, just outside on the ground? I don't want to take the chance of getting ground glass in the drain. I usually just let it evaporate (it never smells) and then I spray the ground glass with water to make a paste, then I use a scraper to clean it out. Does anyone ever have a problem with the bits coming loose and always falling down the shaft? It happens about every 15 minutes! I know they're the right size. Hope by now you've solved it, but maybe you need a new grin screw? Mine did that and the screw has been cross- threaded at some time. Help! I was grinding a small piece of glass and my grinder just quit working. No smoke, no nothing! ( I always have water in the tray..) I don't know what to do..any help would be appreciated..Thank you! I know this is an old post, but this happened to me recently and I am wondering what you did and/or if you determined what the problem was? I thought these grinders were supposed to last years and years. I can't afford a new grinder. Did you check the grinder fuse? Great blog!...very informative...I need to get a small wheel pulling device shown in the blog...where would I obtain one please? 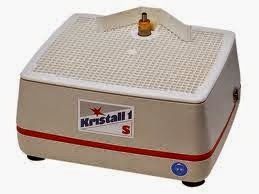 Hi - anyone ever have a problem with the water pump on a Glastar grinder just quitting? It just stopped working today. The grinder itself is just fine. We have tried everything - cleaned the pump tube to make sure there was no blockage, added more water, less water, sponge in, sponge out, leaned the unit in every direction - nothing fixes the problem. Help? Hi. I have the same problem with my Glastar All-Star: the water pump just stopped working. Tried the same things you did, but still not working. Grinder motor is fine. Did you find a fix to this problem? Thanks. Found the problem. The water pump is simply the impeller on the bit drive shaft that spins and forces water from the main reservoir into the tube leading to the upper work table. The impeller can move up the shaft so that it is no longer immersed in the water...therefore no pump action. Simply push the impeller back down the shaft into the water. Works just fine now. I am having a terrible time with my 1/4" bit coming loose shortly after I start grinding. Any little pressure and it is loosening right up to the point of flying off. I am tightening it as much as I can.....but to no avail. Any one else have this problem? hello - how cost it?? This is really a nice and informative, containing all information about Glass Surface Grinding Machine Exporter and also has a great impact on the new technology. Thanks for sharing it. Mike Kelly, did you ever find a fix for you grinder stopping work8ng suddenly, as mine has done the same? Was grinding perfectly well and it suddenly ground to a halt (no pun intended!). When I try switch on and off there is a slight low hum, but nothing else it sounds as though power is gett8ng through but the motor just doesn5 seem to be able to push on properly. I got one that was seized. You can hear the motor hum but it did not turn. I used 3in1 multi purpose oil and soaked the bit until it would come off. Label saiys penetrates rust. After applying a couple of times I was able to remove the bit. I took it all apart and could not see anything wrong. So I put it back together and I sprayed the shaft with liquid wrench with bit removed. I put the bit back on and kept spinning the bit head in my fingers until it was really easy to spin. The shaft moves up and down a bit so it did that a couple of times and voila it is working pulled it back in and it spins.. I hope you get yours working..